Right off the bat the numbers aren't looking good for AMD. 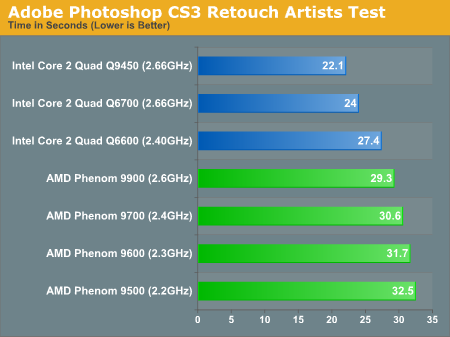 The Phenom 9600 is priced closest to the Core 2 Quad Q6600, but unfortunately for AMD the Q6600 outperforms it by a healthy 10%. AMD needs a 2.6GHz Phenom to equal the performance of the Q6600, but the 9900 won't be out until next year, when it'll have to face the Penryn based Q9450 and Q9300. 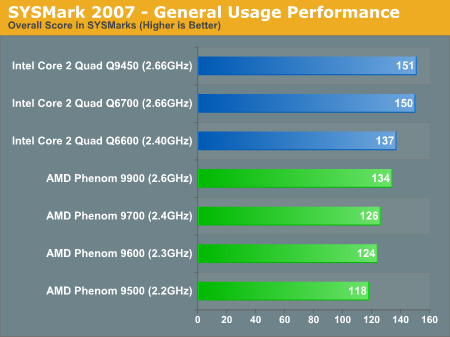 The Core 2 Quad Q6600 is around 6% faster than the Phenom 9900, 10% faster than the Phenom 9700, and almost 16% faster than the Phenom 9600 which is its closest price competitor throughout the rest of 2007. I still believe in AMD, and i know they will release a nice product line-up in the coming months, or probably 2009... i have a Core2 PC now b/c i cant deny the fact that they are really strong CPU's... but my DDR3 upgrade will be on an AM3 system... i think they will be really competitive.